Free and open to the public. Image via http://laurenseiffert.com. CROWDSOURCING REVENGE (justified by comments) is an exhibition exploring the cultural and physical systems that prescribe how humans act and interact. The works are formed from thin steel wire and fibers to suggest the human body, but as a compilation of systems rather than as an individual and are arranged in a manner subtly alluding to an ambiguous or impending violence. The title of the show is in response to the recent phenomena known as crowdsourcing. Specifically, crowdsourcing “justice” and revenge through digital social media post incidents such as the Boston Bombing. Lauren Seiffert is a multimedia artist living in Portland, Oregon. 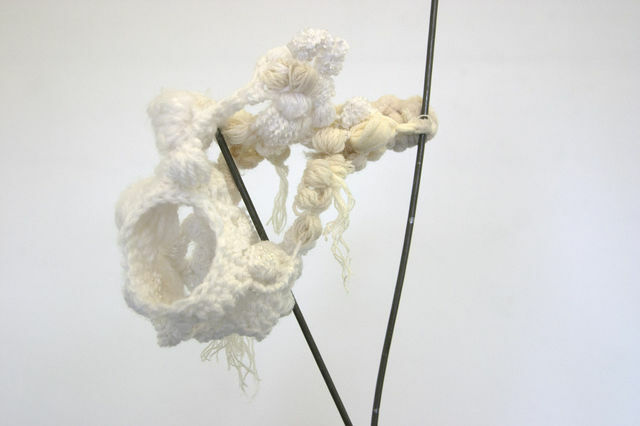 Her work incorporates techniques from multiple disciplines including fiber, sculpture, drawing, performance, and digital art. Lauren received her BFA in both fine art and digital art from the University of Oregon in 2011, and is a current MFA in visual studies candidate at Pacific Northwest College of Art.